Chuseok (추석), originally known as Hangawi (한가위 "the ides of August"), is a major harvest festival and a three-day holiday in Korea celebrated on the 15th day of the 8th month of the lunar calendar. Like many other harvest festivals, it is held around the Autumn Equinox. As a celebration of the good harvest, Koreans visit their ancestral hometowns and share a feast of Korean traditional food such as songpyeon. I've been working at a Korean company for 2 years now and every year I always look forward to Chuseok because I know there will be a long vacation for us employees. This year, I've thought of using the colorful event into an art work. 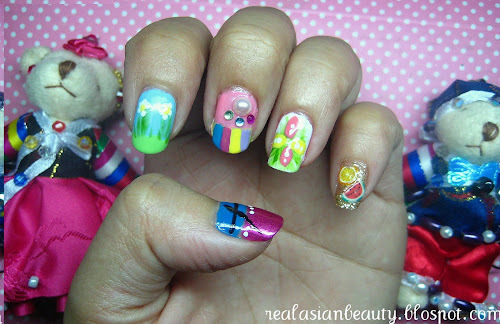 This is how the nail art looks. I also included a bear wearing Hanbok in the photo. (Hanbok is is the traditional Korean dress. It is often characterized by vibrant colors and simple lines). This bear was actually a gift from my sister from Korea. She gave it to me when she came to visit the Philippines.